Yes, I know it’s a bit hazy, but look! There’s books behind me, a sure sign of a literary radio program. And if any of you have the inclination, you can follow this link to the actual show: http://livestream.com/accounts/3269343/events/4004757. It’s an archive of the webcast. At the very least, you get to see what I look like, or part of me, anyway, since my head was tilted towards our host. Hey, you get a fabulous view of my hair. Occasionally, my profile pops out, and there’s a bit where my entire face is visible. It was quite an honor to be asked to participate in “Authors in the Round,” hosted by Karen Kenney Smith of Three Worlds Press. Gwen Jones (my sister), Allison Merritt and me were the featured speakers on this program. Gwen writes Women’s Fiction, Allison writes historical/paranormal/fantasy romances and I write science fiction (of course!). It was a lovely evening at this wonderful place named Murray Grove Retreat and Renewal Center in Lanoka Harbor, New Jersey, about a stone’s throw from the Atlantic Ocean. Karen led us three writers through the writing process, including what made us sit down in front of a computer, let loose our imaginations and string words together like a pearl necklace. What’s weird for me is I never gave much thought to where all my ideas come from and how I managed to squeeze them out into coherent sentences. Talk about putting oneself out there: I even had to read some of the stuff I wrote. I might not be the best person to do that, but I sure had fun acting out one of my main characters. You can hear me talk about my work somewhere in the first 45 minutes, and again towards the very end. 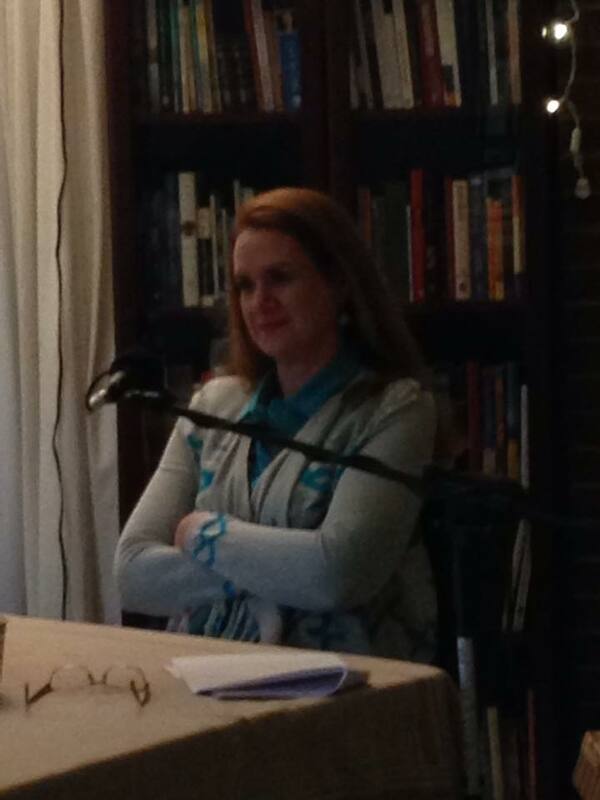 Gwen also reads from her work, too – from “Wanted: Wife” and a slam fiction piece for which she wrote. Allison speaks about her latest work, a Viking romance, although, unfortunately, I forgot the title, but it’s on the video. Take note, fellow bloggers: I mentioned a few of you. I’ve selected a few followers with whom I’ve had some dialogue over writing and such. Wonder who you might be? Well, you can either go to 1:16:00 (approximate) on the link and hear my actual voice speak your names, or you can cheat and let me tell you: Hugh’s News and Views, D.R. Sylvester/Writes and Responsibilities, One Lazy Robot/AntVincino and The Editor’s Journal (I’m sorry I misspoke; I said “The Ladies Journal” instead). I wish I had time to mention all of my followers, for whom I’m very grateful! So sit back, relax, watch the show and let me know what you think! This was a wonderful surprise to hear you speaking my blog name on the radio, thank you so much. I think it is a first for me and my blog to be mentioned anywhere other than on the internet or in person. I’m not aware of any programmes like this on the radio here in the UK and it is therefore so nice for people like yourself to leave links to the programs so we can listen to them. Thank you so much once again, and also for all your continued support. Well, first off, glad you listened and to be of service! The world is a smaller and smaller place these days, isn’t it? Your reach is longer than you thought. Check out the other bloggers I mentioned, too. I forgot to mention Dr. Slater, whose site features the fun side of sci-fi – she’s great. Internet radio is growing by leaps and bounds. I honestly don’t know what it entails but it doesn’t seem to require a whole lot, since the setup was pretty simple. If you contact Livestream, the company who facilitates the show, who knows? You can set up Britain’s first internet radio literary show! Karen Kenney Smith (who hosted the program) has a Facebook page, as well as runs Three Worlds Press (link on my blog). She knows about this stuff. She’s also part of my writer’s group, too. She might cast some insight on other radio shows, She mentioned a few universities in England that hook into the net cast, although I never asked her which ones. Look her up and see what she has to say. Maybe they have a net cast of their own? Oh I will, and I’ve already promoted your post on my Google+ account. I’d love to also promote it on Twitter, but can’t find any Twitter details for you, Gretchen. Do you have Twitter and Google+ accounts? I’d love to add you to mine, especially Google+ which is bringing a lot of traffic to my blog. I try to tweet about once a day, sometimes more. I only just started Google+ and that’s it…started…my husband Andrew and friend Bernie are the only ones on it! Do get in touch with Karen via her publishing site or FB page. She can help you find or start something!